Excited for Nintendo's new tablet-esque controller? So are the kids in TT Games' QA department. An over-excited tester tweeted out an image of a slightly different Wii U slab than the one we laid hands on at E3 2011, teasing "look we what we have at work!" 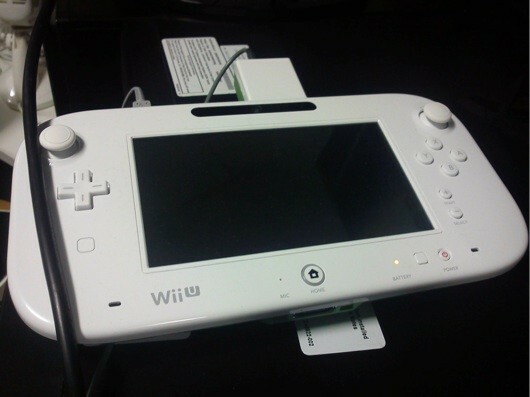 Answering the call does indeed reveal something worth looking at -- a somewhat wider looking Wii U slate featuring two full-sized analog sticks (as opposed to 3DS-like circle pads), a pair of unmarked button-like squares, and a new starboard home for the controller's plus and minus buttons. The tweet was summarily pulled, of course, but not before our friends at Joystiq nabbed a screenshot. Naturally, the rumor mill started right up, churning out speculation of developer specific slabs, early prototypes and late redesigns. The truth? We'll probably need to wait until E3 to find out, but we reached out to Nintendo for a comment all the same. We'll let you know if we hear anything more than the usual "Nintendo doesn't comment on rumors and speculation" line. Alternative Wii U controller design makes brief appearance on Twitter, goes into hiding originally appeared on Engadget on Sun, 20 May 2012 02:25:00 EDT. Please see our terms for use of feeds.